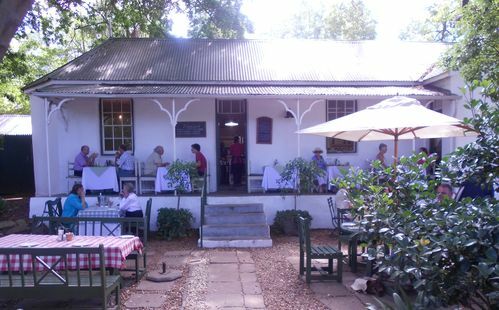 Eugene and I love eating at The Gardener's Cottage in Newlands, Cape Town. It has been in existence for 19 years and for as many years we have been delighted by their lovely homemade food . Visiting the restaurant is a bit like going back in time. There is a gentle and relaxed feel that harks back to another time when life was less trammelled and cluttered with modernity. Let me hasten to add that it is a very modern and up to date establishment. However, the owner, Lee Barty, has created a sanctuary of calm and peace in her cottage under the ancient trees. Lee Barty was a senior lecturer at Silwood Kitchen for some years, but had always nurtured a desire to start a business of her own. A friend informed her that the Michaelis family wished to turn the gardens of the Montebello estate into a place for teaching the underprivileged, which would include a restaurant. She submitted a proposal for her vision for the restaurant. It was accepted and the journey began. The restaurant was to be situated in a derelict cottage on the estate. Originally the Gate Keeper's Lodge, it was refurbished and renamed 'The Gardener's Cottage'. Lee honoured Cecil Michaelis' wish and employed a staff of underprivileged and untrained young people. She taught them everything from dish-washing to waitressing, to every facet of cooking and vitally, she imparted her passion for the preparation and presentation of food and her pride in people's enjoyment of her product. Today, she has a qualified chef whom she employed originally as a dish washer! She has 8 charming and knowledgeable waitresses and 7 kitchen staff. Everything you eat at The Gardener's Cottage is homemade. Just perusing the menu or gazing at the array of wonderful homemade cakes and pastries allows one to realise the extent of the achievement of Lee Barty and her team. She is assisted by her manageress, Melissa Jackson, who has been with the team for two years. There are two faces of The Gardener's Cottage. 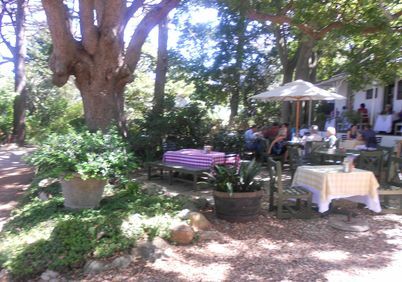 There is the summer face when one may choose to sit outside under the massive old Cedar and Camphor trees that provide a huge umbrella of shade and there is the winter aspect, when one may sit cosily inside the cottage and enjoy heartier food and wonderful homemade soups. Eugene and I love both experiences. Our most recent experiences have been summer lunches and teas under the trees. Summer has the added bonus of being able to take a doggie companion on a lead and to sit in the garden or on the stoep. Several times, we have accompanied friends and their much-loved doggie, Rory, to the Gardener's Cottage. The staff has made him most welcome and guests have doted on him. The menu includes a breakfast section which offers a 'Full Breakfast', 'Gardener's Cottage Eggs Benedict' or you can enjoy a lovely homemade granola with honey, nuts and yoghurt, served with a croissant, butter and homemade jam with filter coffee or tea. There is an "All Day" omelette with a whole host of fillings or you can order a 'Breakfast on Open Toast' with a variety of toppings. All delicious! Lunches in summer offer a selection of salads and light meals. The summer quiche served with salad and homemade bread is delicious. Baked potato and salad, butterflied croissants or open toasts with a variety of toppings are lovely light meals. There are slightly heartier meals which include Gardener's Pies, homemade of course, lovely lamb curry, a coriander chicken dish, a home-made beef mince burger or a chicken breast burger. And there is a blackboard advertising the specials which change weekly. One can then move on to the desserts; a bruléed lemon tart with cream, chocolate pecan nut brownie with cream or ice cream, crepes, ice cream with hot chocolate sauce and much, much more. 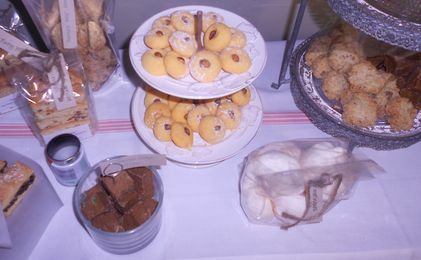 A deceptively bland statement declares ''see cake trolley for our variety" Oh my goodness! Just wait until you see the cakes! And the scones and a particular favourite of mine, the Savoury Muffins. Just divine! There is a carefully chosen wine and drinks menu. The white wines are all available by the glass and also a very good red wine. Beers and Ciders, minerals and sodas are all available. Just about every incarnation of coffee is offered and numerous varieties of tea, hot drinks and milkshakes. Also, fruit juice by the glass or the jug, which is a lovely way to quench one's thirst on a typically warm Cape day. 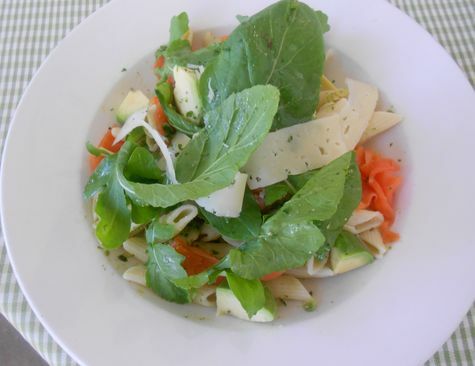 On our most recent meal there, I enjoyed one of the specials, 'Salmon and Avo Penne Pasta Salad with Rocket, Pecorino and a Thai dressing'. Eugene ordered the 'Cape Malay Lamb Curry with Basmati Rice and Poppadum'. While we waited for our food, we nibbled at lovely homemade whole-wheat bread and butter, served on a wooden board. The food was delicious. My salad, beautifully presented in a white china bowl, was fresh, crunchy and succulent. The piquant Thai dressing enhanced the flavours, while the penne was al dente and delicately coated with the dressing. I loved it. Eugene's curry was a skillful blend of flavours and smelled wonderful. It was served with a homemade chutney, chopped tomatoes, parsley and fluffy basmati rice. A big, puffed up poppadum accompanied the dish. He enjoyed every last morsel. The portions are very generous; nobody goes hungry at The Gardener's Cottage. After lunch we wandered inside to see all the wonderful cakes and pastries and fresh produce on the shelves at the Gardeners Store. This is really a sight to behold. Thank heavens we weren't shopping on empty stomachs. Nevertheless, we still came away with a bag bulging with our favourite things. 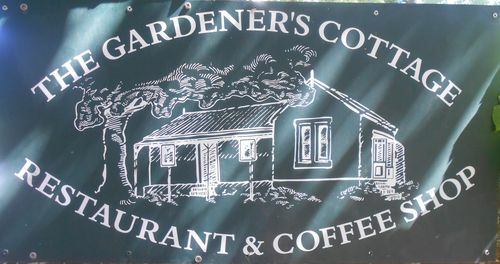 The Gardener's Store produces daily for the restaurant. For special occasions one can order from a wide range of cakes, quiches, chocolate brownies and much more. There are homemade relishes and chutneys on the shelves and other delicious fresh produce. And one can walk in and order something to take away. Now that is really something! We look forward to eating indoors during winter. The tables are dressed in floor-length white linen cloths with green striped covers. The walls are decorated with interesting pictures and prints. Sash windows with their original wooden frames peep out onto the garden. Wooden ceilings and white wooden floors complete the look that I find reminiscent of a once gentler time. The atmosphere is bright and cheery and the welcome warm and friendly. A visit to the Gardener's Cottage has a most salutary effect on both spirit and stomach. The Gardener's Cottage is open from Tuesday to Sunday. 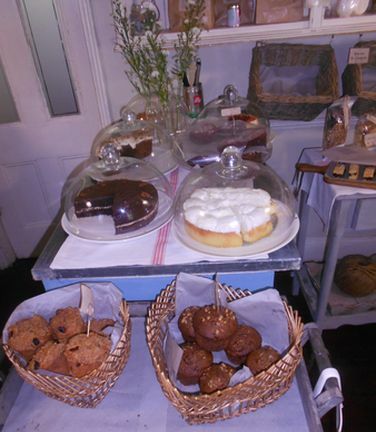 Tea or coffee with wonderful cakes and pastries can be enjoyed throughout the day. Eugene and I love eating out and always pay for ourselves whenever and wherever we go. What a wonderful account of this special little gem of a restaurant, thanks Leslie! Thank you for your lovely comment. I do agree that The Gardener's Cottage is really special. Lovely idea.The Gardener's Cottage is great to me. Thank you for your lovely comment. I am so pleased that you enjoyed the piece on the of The Gardener's Cottage.